Robert Bonine was one of the pioneer cinematographers of the then Fledgling Moving Picture era at the turn of the 20th century. He began his career as a successful photographer , as was his father, and Brother. He transitioned from the career of working in Photo Galleries to providing stereoscopic views and scenic images, then gaining employment as a Motion Picture Cameraman for Edison and also Biograph, to his later years moving to Hawaii and continuing to film local events as well as running a motion picture theater until his death in 1923. Robert Kates Bonine was born on September 14, 1861 in Altoona Pennsylvania. His father Robert A. Bonine was a photographer in Pennsylvania and according to the 1880 census young Robert and his brother Elias also entered this field as a career. In the mid-1880’s, Bonine struck out on his own and opened up his own Photographic Studio in nearby Tyrone PA. Many of the photographers of this period were involved with the production of stereoscopic views. Soon he was providing views of various interesting sights in the United States and later around the world. One of his first mentions of Notoriety was for Stereo View images he took of the Johnstown flood in 1889. Bonine continued to make Stereo Views of various places of interest, He produced a Series using the backdrop of our Nation’s Capitol, in Washington, D.C , as well as New York City and the Colombian Exposition in 1893 held in Chicago. One of the highlights of the exposition was the Display of Edison’s Kinetoscope. One can only imagine how much of an effect this had on him, for while he continued to make some stereo-views as well as other photographic views, the market for Stereo Views was going more and more the way of the few large companies like Underwood and Underwood and eventually the Keystone View Company. 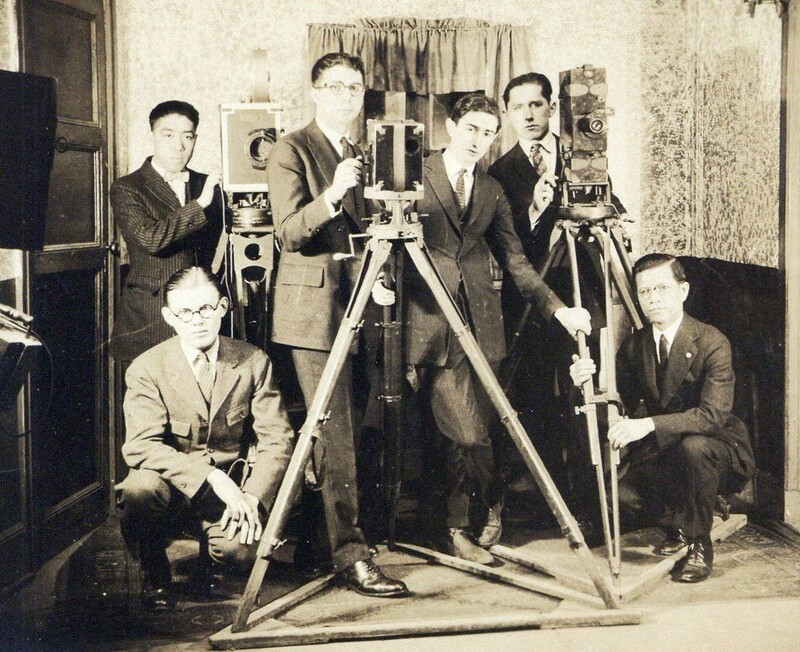 For many of the early photographers, the birth of the fledgling Moving Picture Industry provided a new opportunity for their businesses. As detailed by Bonine himself is an 1920 Article in Educational Film Magazine, his interest in the Motion Picture began in 1897, while in Paris on assignment, he had some dealings with Gaumont who sold Burton Holmes his first camera. Holmes and his cameraman Oscar DePue were at work in Italy , and Bonine had occasion to look in on them through the balance of the following Winter of 1898. He then traveled to Lyon France and was able to make contact with the Lumiere’s and inspect their operation. He seemed to learn the intricacies of this new medium well, as in 1899 he was at work with Edison in Orange New Jersey working in the Film Lab there. In late 1899 a local Canadian Miner and merchant named Thomas Crahan executed a contract with Edison to provide Motion Pictures of the Gold Rush Activity and related events in the Klondike to be presented at the Paris Exposition in 1900. As part of this agreement, Edison beside agreeing to provide a Kinetograph camera, also agreed to provide an experienced operator, he chose Robert K. Bonine to be this operator. Arriving in Canada in July of 1899, Bonine would spend the next 3-4 months filming various subjects and activities in the Klondike region. Upon his return to the Continental United States in the Winter of 1899 Bonine then traveled through the Yellowstone Park area where he filmed the “Great Geysers in Eruption” to quote his own words. For the next few years, Bonine continued to work for Edison, both in the lab, and also working as part of Edison’s team for the ongoing dispute between Edison and Biograph on patent infringement. In the Summer of 1901 R. K. Bonine left the employ of Thomas Edison and signed on as a cameraman with the rival American Mutoscope and Biograph Company. He traveled to Japan, China and the Philippines for Biograph ending his employment there in 1903. Not much is known of his travels during 1904, but in 1905 he returned to the employ of the Edison Company. During this period he worked with Pioneer Edwin S. Porter, and filmed events such as Theodore Roosevelt’s Inauguration, and was one of the cameramen summoned to San Francisco to film the aftermath of the Great Earthquake in 1906. Edison then sent him to travel to the Hawaiian Islands to secure views of local life and flavor there. He arrived in Honolulu on May 31, 1906, and spent the next 60 days filming at locales around the islands. Much of this work came about as a result of contacts that the Hawaiian Promotion Committee had made with Edison’s Film unit inviting them to the Islands in order to film the lush sights of the area. When Bonine returned to the U.S. mainland in August of 1906, he carried with him a reported 20,000 feet of film shot in Hawaii. By early 1907 he was sent to film ongoing construction in the Panama Canal Zone. In 1907 once again Bonine left the employ of Thomas Edison Studios. In January of 1908 Bonine once again returned to the Hawaiian Islands, however this time it seems that he never left again. He must have felt home there, he was highly thought of when as an Edison Employee he had done lots of filming in working with the Hawaiian Promotion Committee in 1906. He continued to film many scenes of local flavor and also ran a local theater for the next 15 years until his death on September 11, 1923. Robert Bonine behind the camera, Hawaii, 1920.